I mentioned previously that I was reading Colin McGinn's book Shakespeare's Philosophy. Well, I just finished his chapter on Macbeth (and another one that I'll be posting on in a couple of days) and thought some of the comments on the role of time in Macbeth were interesting. The role of time in human life is a topic that fascinates me, so I thought I'd share some of McGinn's comments, intermixed with some of my own. Let me begin by saying that Macbeth was my first exposure to Shakespeare. I studied the play for 3 years in second-level and so it has a certain nostalgic value for me (memory and time!). Of course, it doesn't hurt that it is a genuinely great play (indeed, it is "timeless"!). Human life is embedded in time: we remember the past, we plan for the future and we live in the present. We swim in an ever-rolling stream. In my post contrasting comedies and tragedies, I noted that time plays a crucial role in a tragedy. The clock is always ticking, a foreboding soundtrack to a character's ineluctable and unfortunate end. Macbeth is perhaps the purest example of this. 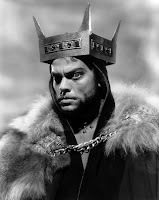 Macbeth, more than any other Shakespearean character, is mesmerised and haunted by time. To be clearer: Macbeth is mesmerised by an imagined future and haunted by his memories of a blood-soaked past. Consider both of these phenomena -- imagination and memory -- in more detail. In his discussion of Macbeth, McGinn gives a broad treatment to the topic of imagination. For instance, he provides copious commentary on the hallucinated dagger that leads Macbeth to Duncan's bedchamber. I want to consider imagination more narrowly, as a speculative conduit to the future. In other words as a psychological faculty that tempts us towards a particular vision of our future lives. If good, why do I yield to that suggestion, Whose horrid image doth unfix my hair and make my seated heart knock at my ribs, against the use of nature. 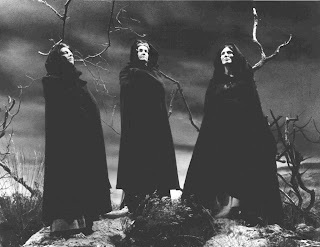 There is something so tantalising, tempting and terrifying about the witches' prophecy. It appeals to Macbeth's vaulting ambition, but it is also destabilising. Before the prophecy he was a reasonably high-ranking thane, and he was probably expecting no more from life (there was limited social mobility in Scotland back then), now he is not so sure. After all, the prophecy is no more than a glimpse of a possible future, the road that will take him there is unclear. Thy letters have transported me beyond this ignorant present, and I feel now the future in an instant. The path will require the murder of the present king. The deed is carried out, but then Macbeth realises that the glorious future he imagined is never quite secure: his kingship is illegitimate and unnatural, he must continually fight off potential threats. In short, more blood must be spilled. Macbeth has become trapped by an imagined future. The most startling illustration of Macbeth's uneasy relationship with the future comes with the murder of his friend Banquo. Banquo had also received a prophecy from the witches. He was told that although he would not be king, he would "beget" kings. Indeed, his seed would give rise to a whole dynasty. 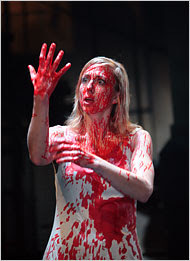 Macbeth cannot allow this, and tries to have Banquo and his son killed. Banquo is dispatched, but the son escapes. It was pointed out to me that Macbeth's desire to prevent Banquo begetting a dynasty is odd. There is no mention in the play of Macbeth's children. They are conspicuous by their absence. So there is no realistic prospect of Macbeth having his own lineage. He must surely know that his kingship will be an ephemeral and temporary thing? Something to be enjoyed while it lasts. But he cannot seem to accept this; he is always fighting the future. But just as imagination provides a conduit to the future, memory provides a conduit to the past. And Macbeth's memories of the dreadful deeds he has performed to become king stalk his every step. Perhaps the most famous illustration is the scene in which the bloody ghost of Banquo interrupts Macbeth when he is having a banquet. And it is not just Macbeth who is haunted by the past; his wife suffers more than he. This is exquisitely portrayed in her sleepwalking scene. She is constantly rubbing her hands, trying to get rid of the bloodstains that she remembers from the murder of the king. Out damned spot! Out, I say!... Yet who would have thought the old man to have had so much blood in him. In short, both Macbeth and his wife were tempted by an imagined future and haunted by a remembered past. No discussion of the role of time in Macbeth would be complete without mentioning the famous last soliloquy. And mentioning this segues neatly with what I was just talking about. She should have died hereafter. There would have been a time for such a word. Tomorrow, and tomorrow, and tomorrow creeps in this petty pace from day to day to the last syllable of recorded time, and all our yesterdays have lighted fools the way to dusty death. Out, out brief candle. Life's but a walking shadow, a poor player that struts and frets his hour upon the stage and then is heard no more. It is a tale, told by an idiot, full of sound and fury, signifying nothing. This passage is truly beautiful. An example of the soaring literary heights that Shakepeare can reach. It almost needs no commentary, but I can't help myself. I think this passage signifies Macbeth's mature understanding of time. He began the play with a naive understanding of time. He was tempted by an imagined future, and tricked into thinking this would be easy to obtain. He eventually realised the errors of his ways: the future is never secure and the past can never be escaped. He now sees that he has lost the battle with time: he made the wrong choices and failed to make his life a unified, and meaningful narrative. Now, this final soliloquy could, of course, be interpreted as a global pessimism about human life. That it is short, petty and signifies nothing, and that this is true of all people. I think it is better to see it as connected directly to Macbeth's choices, and that life can be fulfilling if we reject Macbeth's naivete. This is a theme I will be exploring in more depth in my series on the Divine Comedy's Promenade. The final soliloquy is I believe one of the first recorded instances of nihilism in western literature.